My father was always having a cup of coffee (and – sadly – an unfiltered Camel cigarette) by 4:30 a.m. every morning before going to work. Naturally, the rest of the household was slumbering and dreaming (hopefully Sweet Dreams). 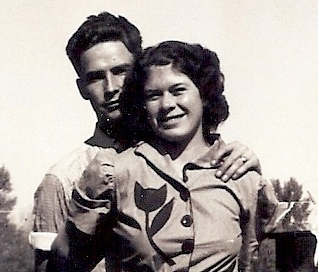 He walked to work; our house – formerly a parsonage – was next door to the Farmington Daily Times building. He would come home for lunch. 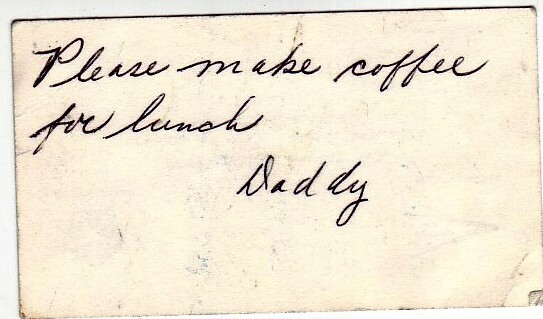 Daddy was always leaving little notes on the kitchen table for Mother. This man would be at work by 5:00 a.m. (at the latest) and home for a quick lunch (generally about 11:30) and would work until the newspaper was ‘put to bed’ and hours after that. Every day. Every single day. Posted in Family and tagged Farmington Daily Times, memories, notes, parents, photographs. Bookmark the permalink.